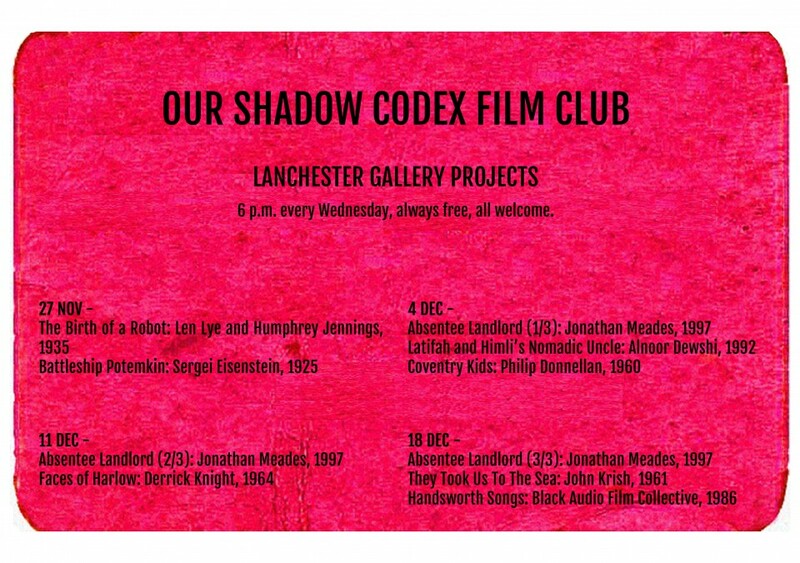 LGP hosted a weekly film night as part of the exhibition OUR SHADOW CODEX. Each Wednesday, LGP screened a programme of rare films and video in the gallery. The selection is drawn from Alan Van Wijgerden’s collection and the original 1960s programme of the Umbrella Film Club. The Umbrella Club was initiated in 1955 by Coventry City Architects Department to encourage the appreciation and practice of arts. Van Wijgerden is a local video artist and documentary maker, who over the last three decades has methodically recorded the political transformation in Coventry. The cinema architecture has been incorporated into the installation build. – a three dimensional animation dream. – first dramatised documentary showing the Russian mutiny on the Battleship Potemkin. Groundbreaking. – Follows the wanderings and wonderings of two South Asian women. – A poetic montage documentary examining the Birmingham Handsworth riots and state racism and brutality.